The Oskhophoria (ὀσχοφόρια), or Oschophoria when Latinized, was an ancient Hellenic festival dedicated to Dionysos, Ariadne, Athena Skiras, and Apollon. This month, festivals are either related to the Eleusinian Mysteries or the mythology surrounding Theseus. This festival is one of the latter. It was a vintage festival and we would like to invite you to join us for it at 10:00 am EDT on October 21th. The Oskhophoria falls during the vintage season in Attica. The principal feature of this festival, the procession, featured ripe grapevines. As such, we can assume that this festival was a thanksgiving for the grape harvest. In fact, branches of vines with fresh grapes were carried in a great procession from the temple of Dionysos in Athens, to the ancient temple of Athena Skiras in Phalerus. This was the main feature of the festival. After Theseus, hero and king, the festival was augmented to include the recounting of his many exploits with accommodation to earlier traditions. It seems that this recounting was done at the banqueting after the ritual and there would be much recounting indeed. Because the festival adopted features from mythology, Apollon also became one of the Theoi sacrificed to, as He is closely tied to the mythology of Theseus. "The feast called Oschophoria, or the feast of boughs, which to this day the Athenians celebrate, was then first instituted by Theseus. For he took not with him the full number of virgins which by lot were to be carried away, but selected two youths of his acquaintance, of fair and womanish faces, but of a manly and forward spirit, and having, by frequent baths, and avoiding the heat and scorching of the sun, with a constant use of all the ointments and washes and dresses that serve to the adorning of the head or smoothing the skin or improving the complexion, in a manner changed them from what they were before, and having taught them farther to counterfeit the very voice and carriage and gait of virgins so that there could not be the least difference perceived, he, undiscovered by any, put them into the number of the Athenian maids designed for Crete. At his return, he and these two youths led up a solemn procession, in the same habit that is now worn by those who carry the vine-branches. Those branches they carry in honour of Bacchus and Ariadne, for the sake of their story before related; or rather because they happened to return in autumn, the time of gathering the grapes. The women, whom they call Deipnopherae, or supper-carriers, are taken into these ceremonies, and assist at the sacrifice, in remembrance and imitation of the mothers of the young men and virgins upon whom the lot fell, for thus they ran about bringing bread and meat to their children; and because the women then told their sons and daughters many tales and stories, to comfort and encourage them under the danger they were going upon, it has still continued a custom that at this feast old fables and tales should be told. For these particularities we are indebted to the history of Demon. There was then a place chosen out, and a temple erected in it to Theseus, and those families out of whom the tribute of the youth was gathered were appointed to pay tax to the temple for sacrifices to him. And the house of the Phytalidae had the overseeing of these sacrifices, Theseus doing them that honour in recompense of their former hospitality." In the myth of Theseus and the minotaur, Theseus, looking to become king of Athens, hears about the Minotaur of Krete, and the nine-yearly sacrifices to it. These sacrifices were a punishment by King Minos of krete for the death of his son Androgeus, at the hands of Athenian assassins. Theseus offered to be one of the youths who sailed for Krete. Once there, Ariadne, daughter of the king, fell for him and offered him a ball of yarn so he would be able to find his way out off the labyrinth that housed the Minotaur the youths would be sacrificed to. Theseus defeated the Minotaur and took Ariadne and her sister Phaedra from their home in thanks for their help. That night, they slept on the beach but Athena woke up Theseus and told him to sail out now, and to leave Ariadne and Phaedra behind. He did, although it pained him greatly. It was here, Dionysos found Ariadne and fell in love with her. He would later end up marrying her and she became his immortal wife. Because the Oskophoria is in many ways two festivals in one, it is a hard one to pin down in terms of modern worship. 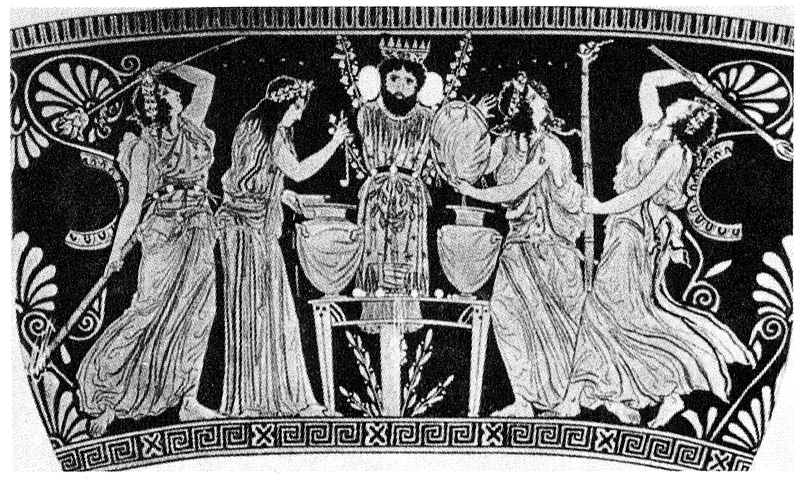 The Oschophoria was essentially a banquet celebration in honor of Theseus and the rescue of youths and maidens and even more so, an older celebration of the vintage combining traditions of Salamis and Athens. Well into the fourth century BC, two branches of the Salaminians were involved in preparation, were Deipnophoroi, and received equal portions of the meat. The vintage rituals of the Salamic Goddess Skiras became associated with Athena Skiras and naturally Dionysos. The various Theseus mythos was explained through the numerous recounting which we have added to the ritual. We hope you join us tomorrow in celebrating this festival. You can join the Facebook community here and find the ritual here.